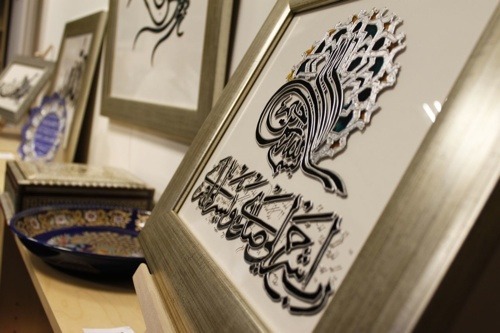 We have a special offer in-store now and are giving 25% off on Labbaik Arts work! The beautiful Calligraphy is by Naazish Chouglay who is a professional painter who spreads the revealed words of the Qur’an through contemporary Islamic Art. Inspired by historical monuments like the Alhambra in Spain and the Blue Mosque in Istanbul, Chouglay combines Islamic Calligraphy in contemporary paintings to create designs which blend aesthetically in today’s homes. She works with acrylics on glass and looks fantastic in any interior. Chouglay is known for selling her stunning paintings to support Muslim women’s education thus all profits made from the artwork are given to IHRC Trust and Muslim women’s education. All the profit made from purchases goes towards the IHRC Trust No. 1106120.